Musings on science, economics, sustainability and a range of related subjects. Edited by our own Jim Salinger, Living in a Warmer World collects essays on the topic of climate change from some of the world’s top climate scientists. It’s a good, solid read, and the work is very accessible for those interested in reading something a bit more digestible than the full IPCC reports. 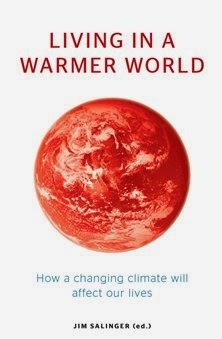 In many ways, communicating the consequences of climate change, as well as our options for mitigating or adapting to rising temperatures and changing climate regimes, is one of the more difficult messages for scientists to communicate to laypeople, so it’s encouraging to see a book like this providing an overview of the topic and how it relates to our lives. There are also some extensive “further reading” sections following each chapter for those wanting to go into further detail on a particular topic. Aside from a brief treatment in the introduction and the chapter on glaciers, the book doesn’t spend a great deal of time on the evidence for human-induced climate change. This is an area on which a great deal has already been written, so it’s not something the book suffers for. Rather, the focus is on the consequences which we can expect to face. The essays cover a variety of topics, including biodiversity, water resources, glaciers, agriculture, fishing and human health. The chapters tie in well together, with some recurring themes, for example shifting geographic ranges have consequences for wild plants and animals, for agriculture and for human health as pests and pathogens likewise shift their ranges polewards. The viticulture chapter illustrates this particularly well, as there is a fairly narrow temperature range for winegrape production during the growing season, and therefore only a narrow latitude band where they can be cultivated. Each chapter also includes an outline of the options available to us to mitigate or adapt to the issue in question. The book closes with some chapters looking at the discussions around climate change, including how scientists, politicians and the media have approached the issue. There is also a discussion of the ethics surrounding the issue – how should we value present costs of reducing emissions compared to the adaptation costs faced by future generations, and who should bear the costs? These are, of course, questions of more than academic interest. Overall, I found this to be a very interesting book, providing a window into a variety of different topics relating to climate change. Definitely recommended reading. I thought I’d settle on invasive species as an initial topic for Science Behind the Curtain, as they are both an interesting and important topic, certain to generate plenty of material for an ongoing series of posts in future. It’s a subject most New Zealanders are familiar with to some extent, as the impacts of introduced mammals such as rats, ferrets and possums on our native bird species are well documented and publicised, but it’s also a broad, global topic, as humans spread new species across geographic barriers, whether deliberately or not, with unintended and often unfortunate consequences. Before the arrival of humanity on the scene, species were able to spread only according to their own ability to disperse. Whilst some might have seeds able to weather long journeys by wind or tide, and others can fly over such over such obstacles, for the most part, geographic barriers such as mountain ranges, deserts or oceans prevent dispersal. However, humans simply don’t take geographic barriers seriously, and we provide a powerful vector for the dispersal of organisms into new ecosystems, whether we do so deliberately or the organisms simply hitch a ride as we move about the globe. There are three things a species requires to become established in a new region. Firstly, it requires a hospitable climate – adverse temperatures, even over only part of a year, can affect organisms’ survival or breeding success. Secondly, it requires an ecological niche to exploit – a lack of suitable habitat or food will also impact survival. Finally, it requires a vector by which to enter the new region, which can be either through natural spread or as a consequence of human activities. Invasive species are distinct from introduced species, in that they have the potential to cause significant ecological or economic damage to those countries they spread into. Given their impacts on both host environments and economies worldwide, a great deal of money and effort has gone into combatting non-indigenous invaders, whether by taking measures to prevent their establishment in a country (by far the cheaper option), or mitigating the spread and impacts of already established invaders. Most New Zealanders are familiar with invasive species to some extent. Essentially, if it’s a carnivorous or omnivorous mammal, we tend to regard it as a furry death machine (much as we may love the family pets). As an isolated pair of islands, New Zealand has been a difficult country for new species to colonise. The oceans have posed a significant barrier to dispersal, to the point that the only native mammals we have are bats. Consequently, without mammals to predate upon them or occupy key habitats, our native bird species have evolved in isolation and are often very vulnerable to introduced predators. Each continent or region has its own unique ecosystem, but what they have in common is that each ecosystem is a finely balanced web of plants and animals which have evolved in concert for millions of years. Natural checks and balances mean that no one species is likely to disrupt the ecosystem, or overpredate, smother or otherwise crowd out other species. However, divorced from that context, lacking the usual controls on their actions, and in the presence of other species which may lack the behaviours necessary to deal with them, introduced species have the potential to run riot in their new environments. The ecological impacts of invasive species do have the potential to damage tourism earnings, if they displace key native species, or alter environments which act as tourist attractions, but generally when people think of the economic impacts of invasive species, they’re considering damage or disruption of commercial crops or farmed animals. There are two forms this can take. Firstly, in a similar way to the ecological impacts above, invasive species may feed upon or parasitise species which may not have evolved to cope with them. Secondly, as many commercial crops and animals are themselves introduced species, if some creature or pathogen from the original environment is subsequently introduced which in some way interacts with the commercial species, there is the potential for the yields farmers have come to enjoy in their absence to be reduced. Indeed, selective breeding for improved yields at the cost of other features which confer resistance to ancestral pests may exacerbate the problem. In either case, costly control measures are required in order to mitigate their impact on crops. This means that farmers have a keen interest in biosecurity controls, and the relevant authorities keep a close eye out for particular invasive species which have a history of successful invasions and subsequent economic impacts elsewhere. Even if a species does get an initial foothold in a country, prompt and decisive action may still see it eliminated. Of all the mammals introduced to New Zealand, the Brush-tailed Possum tends to stand out in peoples’ minds. I help run trap lines to keep them out of a local reserve myself. As with many of our pest species, it was deliberately introduced, in hopes of establishing a fur trade. Native to Australia, the possum evolved in concert with the native vegetation, which is unpalatable in comparison to our own. The possum is a very good example of a species which is not a problem at all in its native environment, but which runs amok in a different ecosystem. 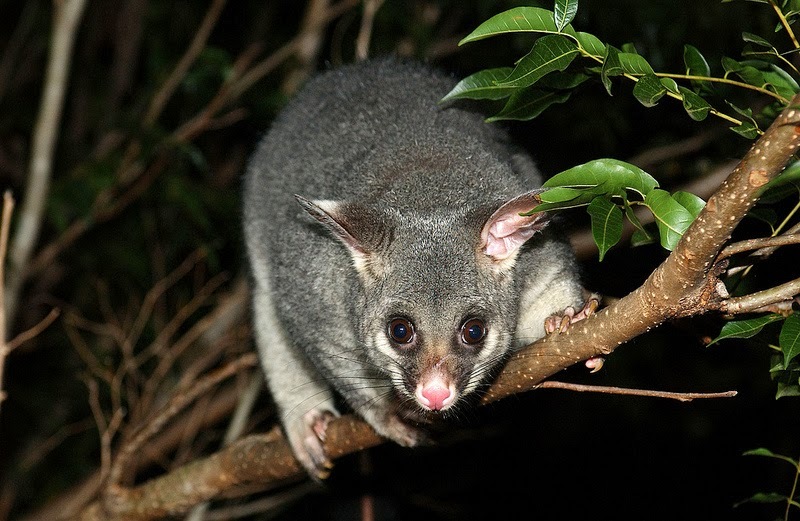 Left unchecked, possums are able to do a great deal of damage to our vegetation, which lacks the defences possums evolved to cope with and, being omnivorous tree-dwellers, they will also devour the eggs and chicks of our native birds. As if that weren’t enough, they transmit bovine tuberculosis, impacting on farm livestock. It’s difficult to put a price on the damage they do, but control operations to keep them in check cost millions annually and represent a significant drain on funds available for conservation work. Public enemy number one: The brush-tailed possum. The Great Lakes of North America are a particular hotspot for invasive species. A considerable fraction of the world’s shipping passes through these waters, taking on and discharging ballast, as well as transporting fouling organisms on their hulls. The aquarium trade has also played its part in introducing species into the lakes. Perhaps the best known invader of the Great Lakes is the Zebra Mussel. Native to the Aral, Black and Caspian Sea regions, in the Great Lakes, this invader not only smothers native clam species but also colonises and clogs water pipes and treatment facilities, necessitating costly procedures to control and remove the mussels. Damages and preventative measures to deal with the Zebra Mussel run into the billions of dollars. Unfortunately, as with most invasive species, eradication is simply not possible once they’ve become established. For those interested, the Global Invasive Species Database provides a listing of invasive species worldwide, with their top 100 list outlining species of particular concern. Update: Serendipitously, I see a very interesting guest post over on SciBlogs from NIWA on aquatic invaders (both weeds and fish) in New Zealand. Well worth a read for anybody who's interested in learning more about the aquatic side of things. Hello and welcome to Science Behind the Curtain. My name’s Chris Banks and I’ll be your host. As a one-time student of biology and of commerce, I have a broad range of interests, relating to ecology, conservation, economics, sustainability and science more generally, and am a voracious reader. As such, I think I have a few things to say on a range of different topics. As a New Zealander, a lot of my blog topics will relate to goings on in my own country, but I’m keen that it should be interesting reading for a range of people. The title Science Behind the Curtain is a reference to The Wizard of Oz. In modern society, we quite cheerfully go about our daily lives without fully realising or appreciating the extraordinary knowledge base which underlies our civilisation. Sometimes we rely on that knowledge in our everyday lives, sometimes not, but either way, drawing back the curtain and seeing just what’s going on is often a fascinating exercise. For the time being, I’ll cover topics of interest to myself, gather a bit of feedback and see how I get along. I look forward to seeing what people have to say on various topics and expanding my horizons as a result.